OKLAHOMA CITY, Okla.— Dr. Imam Imad Enchassi, the senior imam at the Islamic Society of Greater Oklahoma City (ISGOC), says imams in the West like him could play a helpful role in resolving the Al-Aqsa Mosque clashes in Jerusalem. 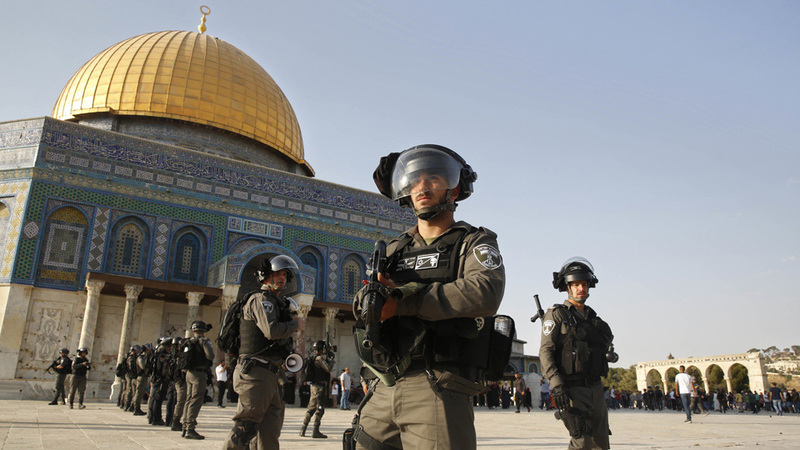 Following an alleged gun attack in the area on July 14, Israeli police decided to bar Palestinian men below the age of 50 from entering Jerusalem’s Old City and Al-Aqsa, one of Islam’s holiest sites. The shooting attack left the assailants, three Palestinian citizens of Israel, and two Israeli border police officers dead. World leaders have weighed in on the violent clashes, with most pushing Israel not to restrict access for worshippers. 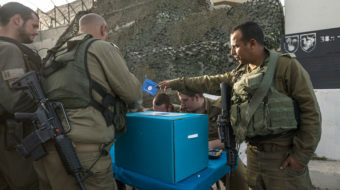 Israel initially responded, however, by deploying at least 3,000 troops across Jerusalem’s Old City to enforce the ban. After nearly two weeks of protests during which at least six Palestinians were killed, more than 1,300 injured, and over 300 arrested, the Al-Aqsa Mosque was re-opened to worshippers of all ages on July 28. 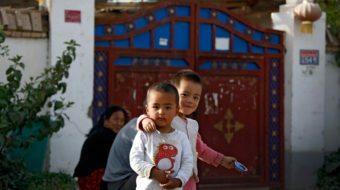 Recently installed surveillance cameras and metal detectors were removed from the entrances of the compound, but tensions remain high. 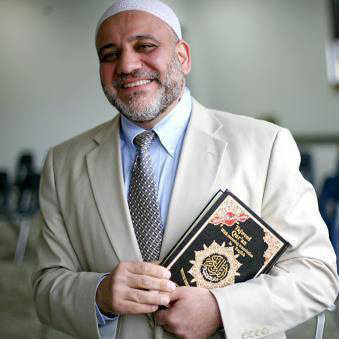 Dr. Imam Imad Enchassi, the senior imam at the Islamic Society of Greater Oklahoma City. The sermon, he said, “was full of hate.” Enchassi believes that imams in the West, because they have experience operating in multi-faith societies, may have a role to play in helping lower the intensity of the religious battles going on in the Middle East. Many of those fights play out between predominantly Jewish Israel and the majority Muslim societies of Palestine and other Arab countries. Unlike religious leaders in either of these two places, imams like Enchassi are accustomed to being in the minority and have altered the way they operate. “I do think Western imams who already have a healthy interfaith relationship with Jewish Rabbis can intervene successfully. Our scholarly and objective views are useful,” he said. Voices committed to peaceful negotiation and co-existence like his, though sometimes hard to come by, are needed if the conflicts around holy places like Al Aqsa are going to be resolved. The Al-Aqsa Mosque is the third holiest site in Islam and is located in the Old City of Jerusalem. In 1538, walls were built around Jerusalem under Suleiman the Magnificent. Today, those walls define the Old City, which has been traditionally divided into four quarters—known since the early 19th century as the Armenian, Christian, Jewish, and Muslim Quarters. 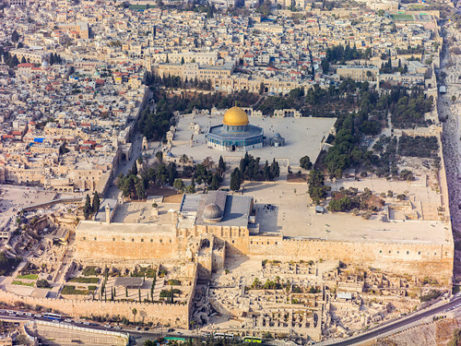 While the entire site on which the golden-domed mosque sits, along with the Dome of the Rock, the seventeen gates, and four minarets, was itself historically known as the Al-Aqsa Mosque, today a narrower definition prevails. The wider compound is usually referred to as al-Haram ash-Sharif (“the Noble Sanctuary”), or the Temple Mount. It has been venerated as a holy site for thousands of years by Judaism, Christianity, and Islam. In more recent times, the year 1967 is the reference point for understanding the disputes around the Temple Mount area. At the end of the 1948 Arab-Israeli war, the armistice split Jerusalem into two pieces. From that time until 1967, western Jerusalem was under Israeli authority, while Jordan controlled the eastern section of the city. In this Jordanian sector was the Old City, where some of the most important Jewish, Muslim, and Christian religious sites were located—including the Temple Mount. But following the Six-Day War of 1967, which pitted Israel against Egypt, Syria, and Jordan, the whole of Jerusalem fell under Israeli control. Thirteen years later, Israel codified its annexation of East Jerusalem, combining the two halves into a single Israeli city. This declaration by Israel remains disputed, however, as the country’s occupation of East Jerusalem is considered illegal under international law. For its part, Israel says that undivided Jerusalem will be its capital, while Palestinians say that East Jerusalem is to be the capital of their future state. Enchassi grew up in the Palestinian refugee camps in Beirut, Lebanon. His experiences as a child, surrounded by war and conflict, have shaped his passion as an adult for promoting unity and understanding. He believes the generation of religious leaders now in positions of influence in the region are unable to step back from those kinds of experiences and bring themselves to negotiate with those they see as oppressors. The Communist Party of Israel (CPI) reported that on July 24 a Palestinian was shot in the head during clashes in the Jerusalem-area town of Hizma. The Palestinian Ministry of Health reported him to be in critical condition. According to the Palestinian Red Crescent Society (PRCS), approximately 1,090 Palestinians were injured in the first days after Israeli authorities installed the metal detectors, turnstiles, and security cameras at the al-Aqsa compound. PRCS statistics indicated that 29 Palestinians were wounded, some seriously, by live fire. Some 370 were injured with rubber-coated steel bullets and, 471 suffered from tear gas inhalation. More than 200 were “physically assaulted, burned or run over” during clashes with Israeli forces. Following a visit to Jerusalem, Aida Touma-Sliman, a member of the Israeli Knesset, said, “The right-wing government is seeking to escalate the situation. The drastic steps it is taking are unprecedented and gravely harm the way of life of Palestinian residents of the occupied city of East Jerusalem.” Touma-Sliman is a member of the Hadash, a coalition of the Communist Party of Israel and other left groups. In 1947, the boundaries set when Britain left Palestine gave well-defined areas of land ownership to Palestinians. 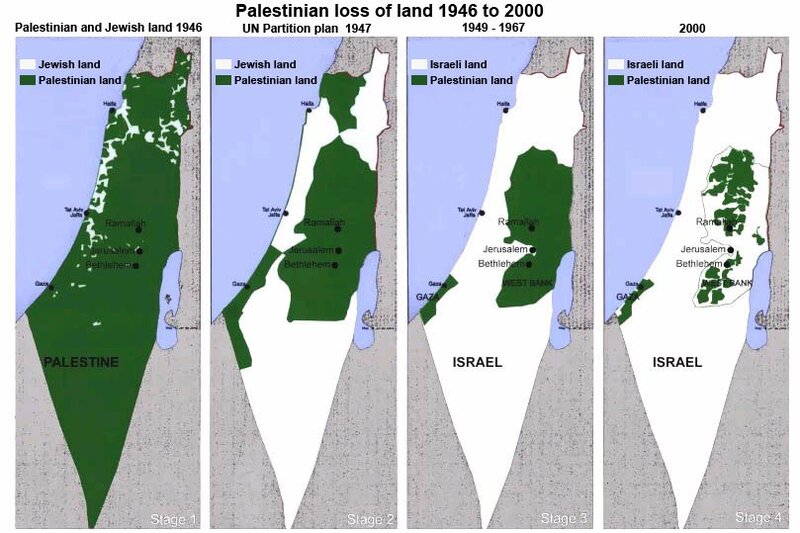 Through the years, Israel has encroached and taken land illegally from them. Current maps reflect 75 percent less Palestinian land than given by the UN in 1947. While in the West Bank in June, 2015, for two weeks, this author saw how Israel’s occupation impacts human rights for Palestinians. Israel controls their right to travel, their water supply, and the building of their homes. Such heavy-handed oppression is the fuel for intense anger and helplessness on the part of Palestinians. The movement of all Palestinians is maniacally controlled by the Israeli Defense Forces (IDF). Sometimes, soldiers hold Palestinians for up to 12 hours when they simply want to walk to Jerusalem (less than a mile) to purchase food. I witnessed the IDF bringing bulldozers into the West Bank. The reason stated for bulldozing a Palestinian home was often that that the occupant had no building permit. 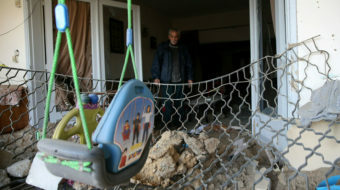 The demolition often occurred while the Palestinian homeowner waved his or her supposedly missing permit in front of the bulldozer. In 2016, the U.S. finalized an agreement for $38 billion in military aid to Israel over the next 10 years. According to a New York Times article, on the day following the agreement, President Barack Obama renewed his call for a two-state solution to the Israeli-Palestinian conflict and argued that it was crucial to Israel’s security, using the completion of the new military aid agreement as an occasion to prod Prime Minister Benjamin Netanyahu on the long-running dispute. With Donald Trump’s ascension to the White House, that strategy has been terminated. Only a few months ago, he heralded a “new day” in U.S.-Israeli relations, seeking to bridge the distance that had developed between Obama and Netanyahu. Trump says his administration and Israel will be so close that “no daylight” will appear between the two. With the U.S. now once again so firm in its uncritical embrace of Netanyahu’s right-wing government, it is getting harder to see how good faith international negotiations can proceed. And it seems a formula for pushing even more Palestinians to react, as Enchassi says, “emotionally,” rather than cooperatively to the situation around them. The Palestinians are defenseless against the martial law enforced by Israel. They are denied a nation and citizenship rights by the policies of the Israeli government. Dr. Enchassi’s idea of a cooperative, multi-faith approach by Western imams may be part of the way forward. But any resolution needs to be between Palestinians and Israel. Meddling by the U.S. on behalf of Israel not only impinges on Palestinian sovereignty; it makes peace impossible. 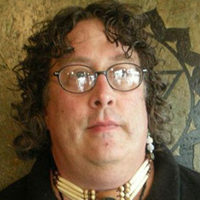 Barbara Russum contributed to this article. Oklahoman Mark Maxey is a Yuchi Indian, enrolled in the Muscogee Nation, and has a degree in radio/TV/film. He is a member of the National Writers Union, UAW Local 1981/AFL-CIO. He’s worked as an administrative assistant, petroleum landman, barista, staff writer, paralegal, content producer and graphic designer. He spent six months as a National Data Team volunteer for the Bernie Sanders for President campaign.